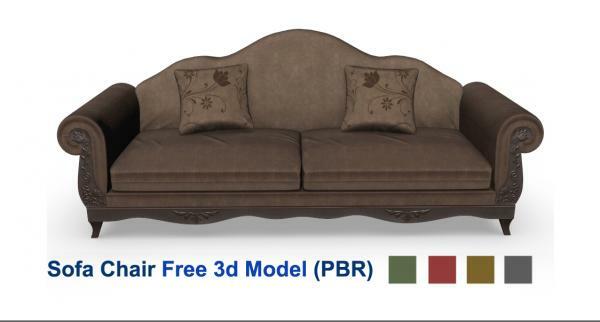 This is a polygon model of Sofa with PBR compatible materials in multiple colors. Autodesk Maya 2016 .mb, FBX and OBJ. Software used: Autodesk Maya 2016, Zbrush,Photoshop and Substance Painter. Texture Maps: Base Color, Normal, Metallic, Roughness and Ambient Occlusion. AndyS (1 year ago) Inappropriate? with iRay render parameters for glossyness you have the choice to influence the intensity of the glossy effect with b/w textures and you can influence the roughness value with those maps. I decided to do the last possibility and the outcome was quite nice. Just wanted to know what your intention related to that map was. Depending on the render engine and the available params a darker value in the map could create more glossy or rough zones. That's the general problem if an asset can be used by that much different 3d-tools. Animated Heaven (1 year ago) Inappropriate? Hello Andy, thanks for the comments. Actually I am not familiar with materials of DAZ studio, this model was created in Maya and textured in Substance Painter. Roughness maps define the microsurface of the material (how rough or smooth it is), and do not replace a specular intensity map. However, if youâ��re not used to working with gloss maps, it may be somewhat of an adjustment to more …Hello Andy, thanks for the comments. Roughness maps define the microsurface of the material (how rough or smooth it is), and do not replace a specular intensity map. However, if youâ��re not used to working with gloss maps, it may be somewhat of an adjustment to put certain detail in the gloss map that you would otherwise add to the specular map. Only the sides better would have two different material zones (wood and fabric) -> different glossy effect. Working in DAZ3D the materials didn't load, although parameter in load dialog active. What do you mean with "texture_roughness"? Is it for the iRay Roughness value or simply "Glossy Layered Weight"? In general: A worth piece of more …Nice work. Very detailed. In general: A worth piece of furniture. Beautiful; thank you very much! Very nice model here. Thank You!